Khalifa International Stadium, the first of Qatar’s world cup stadiums, which will be ready by next month, was re-pitched in a record time as construction of 2022 projects speed-up. With the 2022 Qatar World Cup just five years ahead, Qatar is ready to inaugurate the first of eight world cup stadiums. Originally scheduled to be completed by the end of 2016, the Aspire Zone Foundation announced that Khalifa International Stadium will be up and ready in July. The Khalifa International Stadium is one of Qatar’s oldest stadiums and was first opened in March 1976, but was renovated in 2005. With Qatar winning its bid to host the 2022 World Cup, the stadium was put under a redevelopment project that started in 2014 to get it inline with FIFA standards. According to Aspire Zone Foundation, 7,800 square meters of turf was laid out on the pitch in just 13 and a half hours, a new world record. Once completed, Khalifa International will have a seating capacity of 40,000 and will host several 2022 World Cup matches leading up to the quarter-finals. Qatar is expected to complete at least seven more stadiums by 2020, many of which are behind on schedule. The stadiums are Al Rayyan, Al Wakrah, Al Bayt Al Khor, Qatar Foundation, Lusail, Ras Abu Aboud and Al Thumama. Earlier this month Aspire Zone Foundation announced that work on Al Bayt Stadium is progressing on schedule. According to AZF, 40% of the stadium’s structural work has already been completed and 25% of the construction work on the stadium’s surroundings. The architecturally unique Al Bayt will have the capacity to accommodate as many as 60,000 fans and will have a state-of-the-art retractable roof that will take just 20 minutes to close. 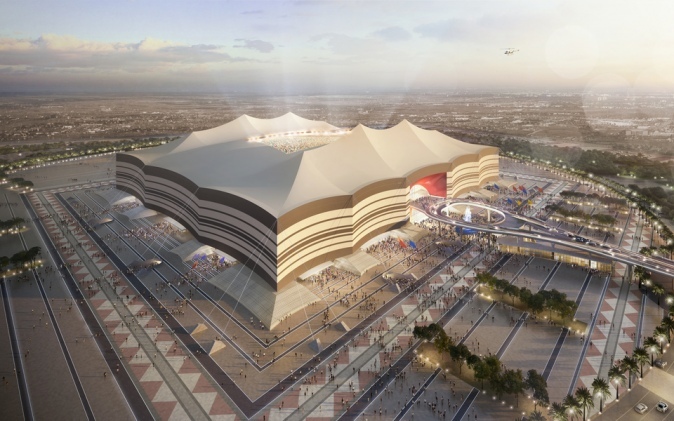 A 3,000-man strong workforce are working on finishing the stadium which is designed to resemble a tent, representing the historical culture of native Qatari and Arab tribes.